The suffrage movement marks a watershed in the history of women’s movements and continues to inspire feminist contestations across the world. However, all forms of delineations and depictions on the suffrage movement, whether in academia or popular culture, exclusively focus on the role and struggles of the women in the West. 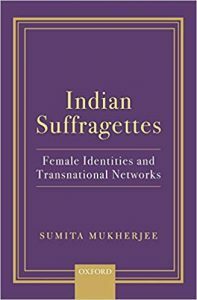 In her extensively researched work, Indian Suffragettes: Female Identities and Transnational Networks, Sumita Mukherjee emphasizes the need to look at the suffrage issue as a global one and focuses on the seminal role played by the Indian suffragettes. The book highlights not only the suffrage campaigns that took place in India but also brings forth the engagements of the Indian suffragettes with global feminist networks. This is immensely pertinent in the context of the growing visibility of transnational networks in the international arena. There has been a surge of literature in the last few decades that examines the transformative potential of transnational networks (Clark et al. 1998, Keck and Sikkink 1999, Karen and Murphy 2000). It is fascinating, therefore, that the book brings forth historical details on transnational coalitions formed by female suffragettes during the colonial era that opens up critical inquiries into notions on citizenship, class, race and gender. While the book is placed in the time period between 1910 and 1950 and its focus is the campaigns of Indian suffragettes, it has significant relevance in the current socio-political context in India. Women’s movement in India today is striving to stimulate transformative feminist politics in the face of divergent ideological and theoretical positions within the movement. The imagination of a feminist citizenship by Indian suffragettes that the book has been able to bring forth could be truly inspiring for the current movement. The book is divided into five chapters that locate Indian suffragettes in different spatial realities—as imperial subjects negotiating their ‘regional’ identities; as ‘citizens of the empire’ positioning themselves within the ‘Commonwealth’ forging new forms of solidarity; engaging with international feminist movements, organizations, conferences and networks while recognizing the burning need to be free and equal citizens in a deeply unequal international order; developing ‘Asian sisterhood’ networks building on a pan-Asian identity; locating themselves within the Indian national movement while rejecting British feminist interventions and involvements. The epilogue looks briefly at the Indian women’s movement after 1947 emphasizing particularly on the issue of women’s political representation. The scope of the book thus is wide and exhaustive, for which Mukherjee accesses extensive archival sources, organizational records, government reports, correspondence and memoranda. Through a historical analysis of the diverse campaigns of Indian suffragettes, the book is able to bring out facets of the women’s movement and the nationalist movement in India that have largely been unexplored in existing literature. This review attempts to highlight certain key themes that shape the historical narrative of the book. The movement for the right to vote in the context of the West is connected to both the liberal women’s rights movement and early socialist feminism of the late 19th and 20th century (the first-wave). Mukherjee, however, points out that there was a conscious attempt on the part of many of the Indian women activists during this era to disassociate themselves from the term ‘feminist’ and western feminist movements. Arguing that despite rejecting the term ‘feminist’, Indian women continued to engage with feminist concerns, Mukherjee in her book is able to compellingly examine the tensions between the feminist, nationalist and anti-imperialist struggles of the Indian suffragettes. While the Indian women’s movement was united with Indian men in their construction of imperialism as the cause of all inequality, for British suffragettes Indian women were their ‘feminist burden’ (p. 29) to be rescued from their sufferings. ‘Imperial feminism’ (p. 29) promoted a form of ‘moral and pure imperialism’ using the stereotype of ‘enslaved’ Indian women (p. 29). Mukherjee also brings out the diverse positions and complexities of the arguments put forth by British suffragettes where India was ‘invoked’ in the arguments of both pro and anti-suffragists (p. 30). The book further captures the experiences of Indian suffragettes engaging and campaigning with their British counterparts, which enabled them to construct their struggle for suffrage as part of a larger movement that is not constrained within national boundaries. Indian suffragettes were also effective in creating networks of solidarity with women from other parts of the British Empire and the Commonwealth, especially engaging with Kenya, South Africa and Australia. Mukherjee uses the term ‘colonial feminism’ (p. 78) to describe these networks and conversations that strengthened and inspired the Indian suffrage movement. Indian women suffragettes, while engaging with the Commonwealth and international feminist networks, were becoming increasingly conscious of the need to forge networks with women from other parts of Asia. Their efforts led to the foundation of the All-Asian Women’s Conference (AAWC) in 1931. This imagination of an ‘Asian sisterhood’ (p.156), which countered ‘feminist Orientalism’ (p.157), went beyond the modern-day conceptions of Asia and included the Middle East going as far as the Pacific. However, while seeking to counter the homogenizing of the experiences of all Asian women by western feminists, the Asian sisterhood networks emphasized solidarity of Asian women as stemming from a shared commitment to ‘family, spirituality and domesticity’ (p. 193). This reinforced exiting stereotypes on ‘Eastern’ women instead of challenging them. Women are not a homogenous category. Hierarchies of race, class, caste and other forms of exclusions and discriminations shape the lived realities of women. The Indian suffragettes, Mukherjee argues, remained largely divorced from these social realities. On these questions of marginalization, they mostly maintained silence not only within India but also elsewhere in the empire. The movement was dominated largely by elite urban women who claimed to represent the interests of all Indian women. In their engagements with international networks as well, Indian suffragettes assumed the position of a ‘monolithic Indian identity’ that was unwilling to recognize ‘the complexities of the ways in which women could be disenfranchised in India’ (p.153). In their campaigns in Commonwealth locations such as Kenya and South Africa, Indian suffragettes were not disposed towards forging solidarity with ‘black’ Africans. Similarly, they did not ally with disenfranchized groups such as the Aborigines in Australia while forming networks of colonial feminism. Mukherjee, however, acknowledges that Indian suffragettes as colonial subjects themselves lacked the required ‘political leverage’ (p. 91) to take up the cause of other disenfranchized groups. Shifting contestations around the notion of citizenship was central to the struggles and movements of the Indian suffragettes. In the early years of their movement, they largely located themselves as ‘imperial citizens’ (p. 27) forging a sense of solidarity with British women. Indian suffragettes sought to invoke an ‘imperial responsibility’ (p. 27) in their British counterparts to invite their support. Mukherjee further records the participation and involvement of Indian women as imperial citizens in the British suffrage movement. However, with their growing association with the global feminist networks, there was a deeper consciousness of their status as imperial subjects. This propelled the suffragettes to strive towards achieving equal citizenship rights that brought them into the fold of the nationalist struggle. Particularly in the 1930s, there was an increasing participation of Indian suffragettes in the growing anti-colonial protests and demonstrations where they confronted brutal colonial repression. This further compelled the Indian suffragettes to address the questions on national identity and citizenship. Mukherjee in this book lays out a comprehensive discussion on the trajectories of constitutional negotiations on female suffrage in India between 1930 and 1935, underlining the complex ways in which the concerns on political representation in India unfolded at the backdrop of growing nationalism, emergence of communal tensions and resistance towards British feminist interventions. The issue of universal adult franchise thus came to be formed as a question of citizenship rights that was deeply intertwined with creating a sense of Indian womanhood. The suffrage movement was about getting women the right to political equality by ensuring the right to vote. However, where do we find ourselves today in terms of women’s political participation and representation in India? Following the historical analysis of this book on the suffrage movement in India, one cannot escape addressing this question. As Mukherjee notes, although the Indian suffragettes did not encounter challenges from the nationalist leaders on the question of political equality, concerns on women’s disadvantageous position in Indian society were left largely unaddressed. This had serious implications in terms of women’s political representation in the post-Independence era. The Towards Equality report of 1974 argues that the ideal of ‘right to political equality’ in the true sense ‘has not enabled women to play their roles as partners and constituents in the political process’(1974, 302). According to the Women in Politics 2017 Map launched by the Inter-Parliamentary Union (IPU) and UN Women, globally India is at 148th position in representation of women in executive government. It, therefore, must be acknowledged that entry to political institutions and processes is also closely connected to the degree to which women have access to economic, cultural, and natural resources within their own immediate situation. Although the book in its epilogue does address this issue of women’s political representation post-1947, there is a definite possibility of building on the detailed investigation on female suffrage in India laid out in the book to examine the ways in which the question of citizenship is deeply linked with interrogations on inclusion and exclusion. Mundy, Karen and Lynn Murphy (2000), ‘Transnational Advocacy, Global Civil Society? Emerging Evidence from the Field of Education’, Comparative Education Review, 45(1): 85-126. Towards Equality, Report of the Committee on the Status of Women in India, (1974), New Delhi: Department of Education and Social Welfare, Government of India. Upasana Mahanta is an Associate Professor and Director, Office of Student Life and Cultural Engagement, and Executive Director, Centre for Women, Law and Social Change, Jindal Global Law School, O.P. Jindal Global University, Sonipat, Haryana.